On Monday (08/10) Indonesia Investments released the September 2018 edition of its monthly research report. The report aims to inform the reader of the key political, economic and social developments that occurred in Indonesia in the month of September 2018 and also touches upon key international developments that impacted on the Indonesian economy. 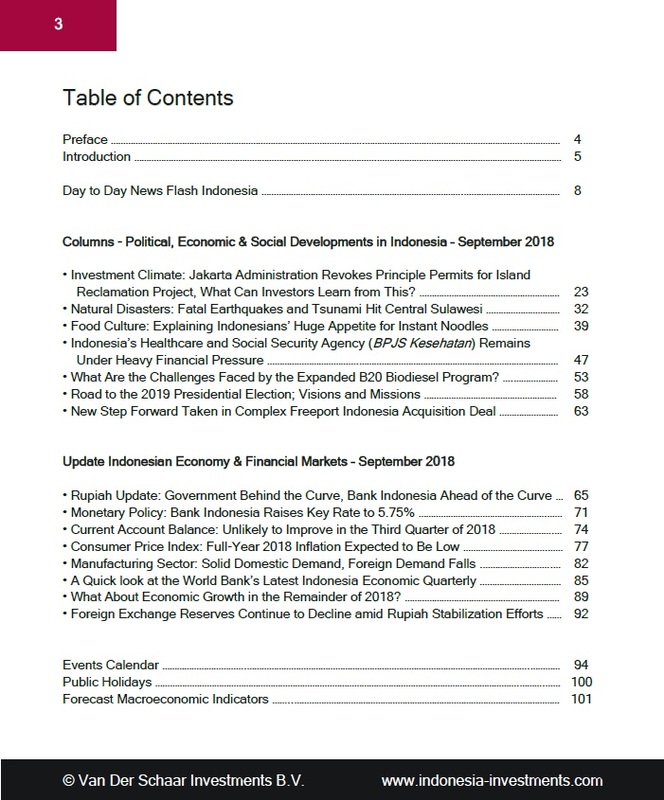 Besides updates on various topics - including Indonesia's 2019 presidential election, monetary policy, the performance of the rupiah, the consumer price index, manufacturing activity, and the current account balance - the September edition also includes in-depth columns on the topic of the (scrapped) island reclamation project north of Jakarta, the devastating tsunami that hit Central Sulawesi, the challenges faced by the expanded B20 biodiesel program, the financial trouble of the universal healthcare program, and more.